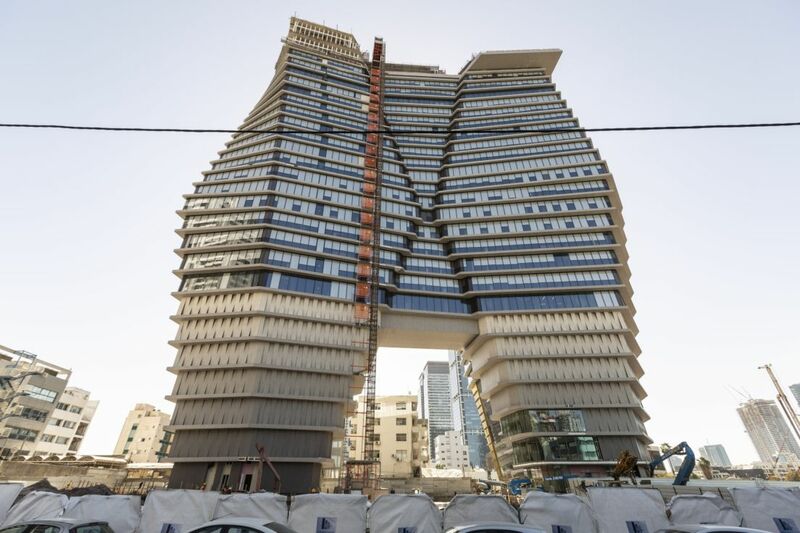 The unusual proportions of the 'Totzeret Haaretz' building in Tel Aviv, with architect and superstar designer Ron Arad’s distinctive style built into it, can elicit extreme reactions. Some hate it, some love it and some are plain awed by its sophistication. 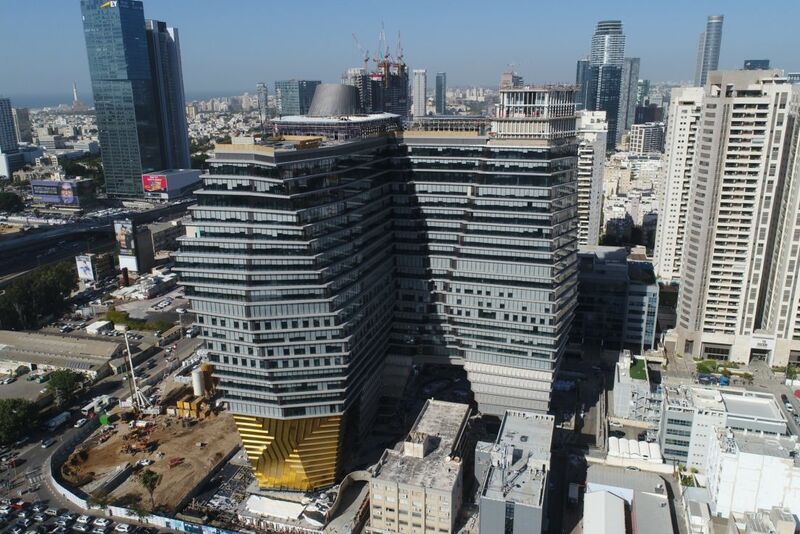 The building, a few minutes’ walk east of the large Shalom train station, is indeed taking up a prominent place on the ever-more crowded skyline of the Tel Aviv metropolis. It will house mainly office space, but its look is quite different than the other multistory buildings that have gone up around it of late, like the Azrieli buildings or the Amot Atrium Tower: It is not narrow, but rather has a relatively low and plump profile, and rises 27 stories, to be joined by a far taller tower of 60 stories. 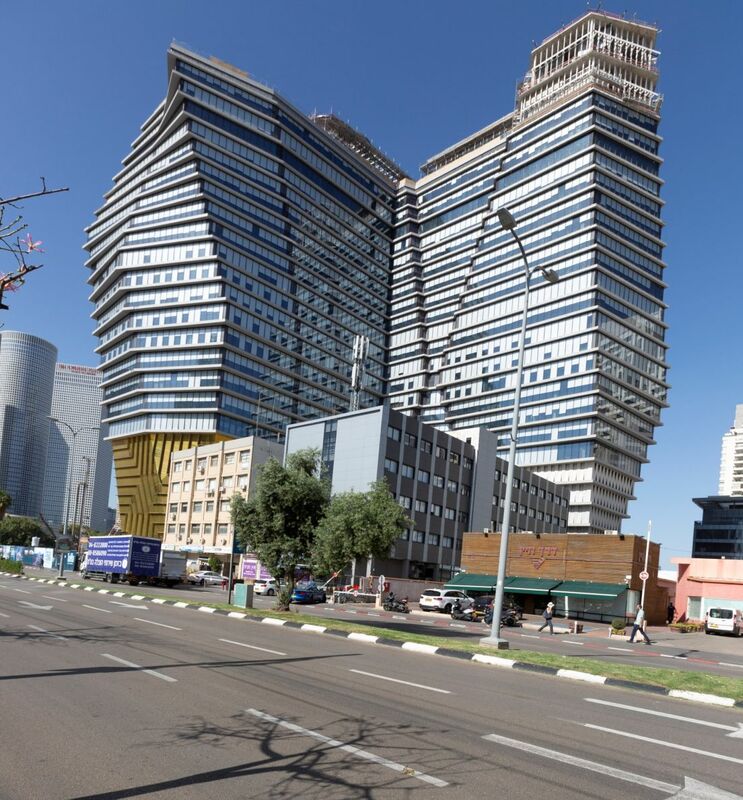 Arad’s Israeli-British firm was joined, in the design of Totzeret Haaretz, by the local firm of Yashar Architects. 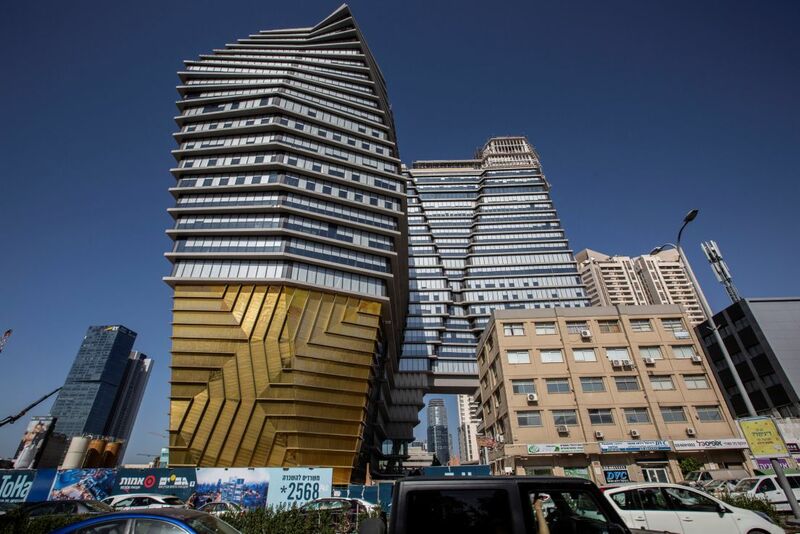 Headed by Avner Yashar, the company already has to its credit a number of projects in the city, among them 1 Rothschild Boulevard, the Wholesale Market project and the Bezalel Market. The project’s developers are the Amot and Gav Yam companies, who turned to Arad in 2012 with a request that he come up with an extraordinary architectural concept for them. To that end, they embarked on a long statutory process intended to combine seven different lots into one large plot of land of more than 18 dunams (about 193,750 square feet) for the site of the complex. 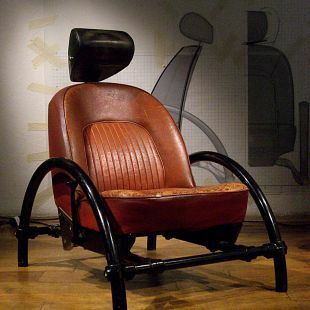 Arad maintains a relatively small studio, with about 20 employees, who work on a wide range of projects -- from product design to sculpture, and from interior design to public buildings. In Israel, the latter include the Beit Shulamit Cancer Center, at Afula’s Emek Medical Center, and currently under construction. Seen from above, the Totzeret Haaretz complex is like the letter “L” placed on three legs, each of which rises into a tower of increasing width as it goes higher. The quasi-towers connect with one another via a broad bridge, creating a three-legged complex. 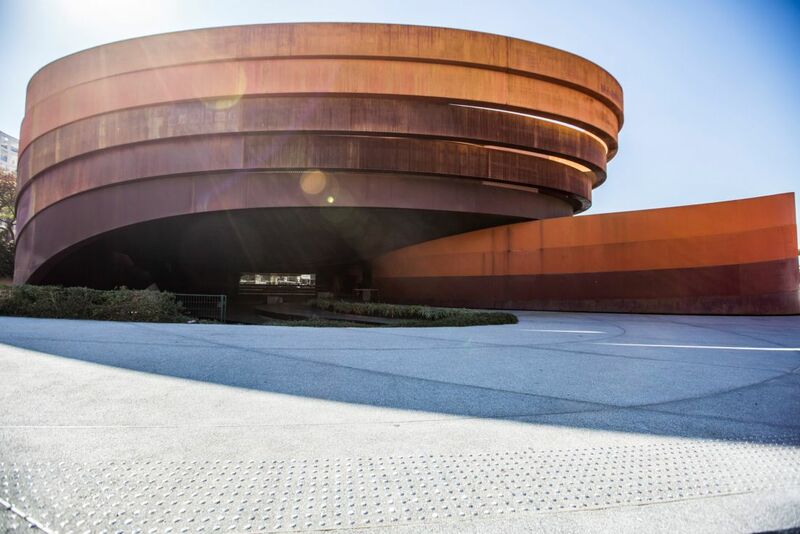 One of these legs, which has been sheathed in brass sheeting that now appears golden in color, has attracted attention, although the architects explain that the material will darken into a shade of bronze. “I wanted the facade that faces the street to get a special treatment,” Asa Bruno explains to us on a tour of the intriguing sie. 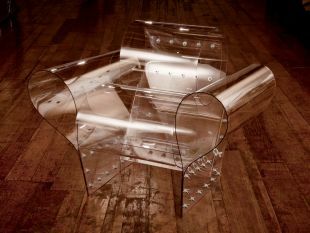 “We don’t like to use materials that are treated or painted to look like something else. We are always looking for qualities that come with the material, with its integrity. This material will acquire a natural patina within a few months and will be less shiny and bright. “The footprint of the complex covers 1.5 dunams of the plot (just under 16,150 square feet), and containing 5,000 square meters (nearly 54,000 square feet) of floor space. That’s much more than in similar buildings on a similar-size piece of land,” Bruno notes, adding that the generous space between each pair of feet on the structure allows pedestrians to continue to see the city though the building. As a result, the complex is not experienced as a wall of towers (though residents of the tall buildings in Nahalat Yitzhak do experience it as a wall in front of their windows). Also freeing up ground space is the developers’ decision to situate only a restaurant and a cafe at street level, instead of building a shopping mall, as is common with other multi-story buildings in the area. In order to encourage workers in the building to use green transportation, the structure offers hundreds of secured parking spaces for bicycles. The underground parking lot, in contrast, has only 950 spaces – less than the 1,300 that were approved by the planning commissions. 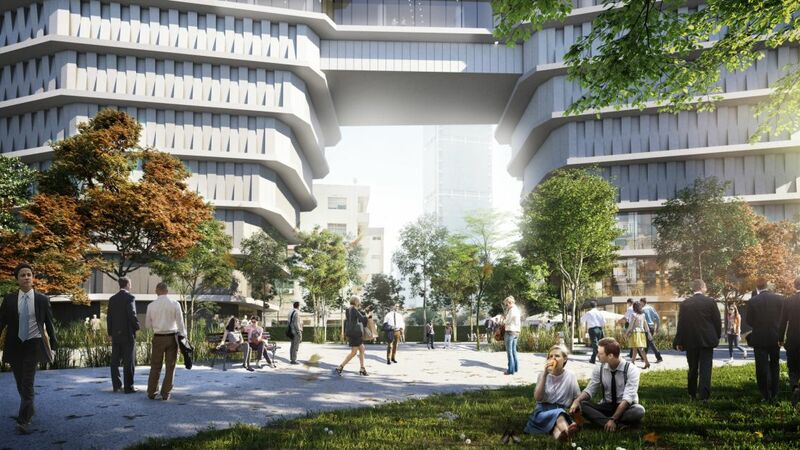 ToHa is the most significant complex at the intersection of Derekh Hashalom and Yigal Alon Boulevard, but around it are many other plots that are expected to accommodate multi-story buildings. It is not yet known how they will connect with one another; what is clear is that this is going to be a very hot section of Gush Dan: In addition to the adjacent train station, an express lane for public transport, and in the more distant future, two metro lines. Today, the area is not pedestrian-friendly, but the decision to make the ground floor of Totzeret Haaretz a public space could indicate a trend, and even set a high bar for other developers who will build multi-story buildings here, as well as to municipal policy makers. In any case, City Hall would do well in the near future to present the public with a collage of all the projects slated for the area. Landscape architect Lital Szmuk, who is working on the project’s landscape design, says that the ground floor will be exceptional, and vary from other private open spaces around the city. Very often the developers who manage such spaces prefer to design them in a way that in keeps pedestrians away, so that even though they are designated for public use, they end up being empty. (Examples of this phenomenon are the Frishman 46 building, at the corner of Dizengoff Street, and the Remez Tower on Arlosoroff St.) Here, says Szmuk, a great deal of effort has been put specifically into drawing in the public. “This is the largest perlite order we’ve ever made at the firm,” she says, referring to the irregularly shaped pebbles of volcanic glass used as a medium for growing plants. 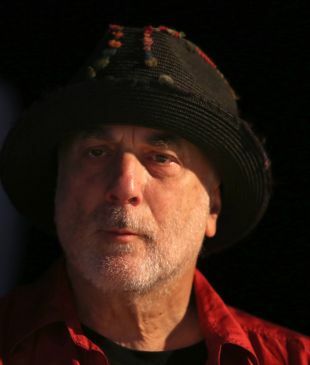 “It’s costing millions of shekels. We are going to plant hundreds of trees, including oaks, poincianas, poplars, trumpet trees, blue jacarandas and mulberries on a bed one meter to a meter and a half deep. Some of the trees are already very big and have been moved from other projects. It should be noted that while the grove the developers are planting does contribute to the branding of the project, it is the result of negotiations with the municipality, which in return allowed the developers to put up a complex with very extensive building rights. Preparations for the planting are already underway, but at the moment, imagination is required to understand how the grove will look at the end of the process. In contrast, there is no need to imagine the parts of the building itself – most of them are already in place. From the ground floor, you enter an impressive atrium that is 30 meters high (about 98 feet), and that extends into a skylight of another 70 or so meters. The lower section is bounded by two slanted glass walls that are textured in a way designed to prevent glare. The individual floors are different from one another, but have an average floorspace of 2,800 to 3,000 square meters. The structural envelope has been planned as a series of fixed units that enable optimal and economical planning. Chen Shalita, the green construction consultant for the project, says that the planners have aimed to create a building where it will be pleasant to work. “The light is controlled,” he says. “There are buildings where the workers suffer from glare and others where they suffer from insufficient light. When it’s pleasant for the worker, productivity is higher. 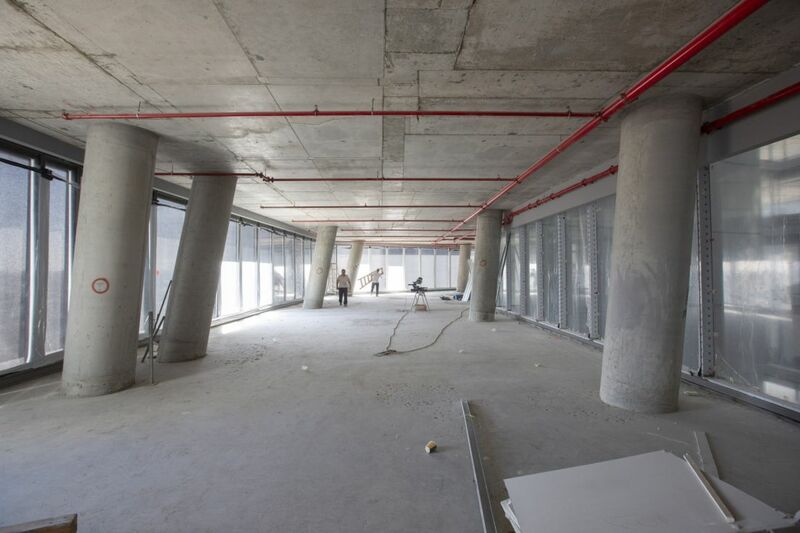 This is an important issue today for planning offices.” Bruno and Shalita will be addressing just this issue at a conference of the Israeli Green Building Council, scheduled for Tel Aviv University on November 19. 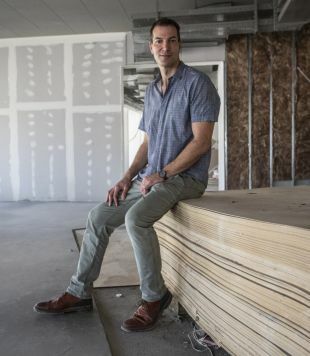 The companies renting spaces in the building are companies requring large floorspace – such as Natural Intelligence, which has rented three floors, and WeWork, which is down for four. Other companies that will relocate in the building are Tufin, which is in the field of information security infrastructures and networks in organizations, and the Israeli-Singaporean company Trax. “These are companies that want to feel they are in one large space. Large floors enable closeness among the workers. No [other] tower can provide a floor of 3,000 meters. We did this before other competitors,” says Abudraham. What was the motivation for a ground floor that is mostly open to the public?